Celebrating the “Royal Wedding” with a cup of tea, goodies and conversation. Look at all the wonderful hats!!! 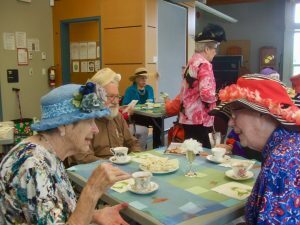 Friday afternoons from 1:30 to 3:30, the On-The-Go-Again group meets in the big room to chat, listen to a speaker, play games, watch an armchair travel presentation, reminisce, and have tea together. This group of about 20, along with several helpers, have a warm social time together. We “solve the world’s problems,” cook up all sorts of advice for our politicians, and try to understand what in the world is going on in our grandkids’ worlds. Gwen MacPherson and Bobbi Johannessen had a meeting a couple of weeks ago with Cherie Miltimore, Coordinator of Volunteer Services for Saanich Volunteer Services Society. She had not been to the Centre and was curious about what went on here. They showed her around, gave her some history and talked mostly about OTGA. She was most impressed and has put us in touch with Jenneke van Hermert of Therapeutic Meals. We have arranged for Jenneke to visit OTGA on the first Friday of each month (March, April, May, June, September and October) to give a presentation. May 3: The Gut – All kinds of gut issues: keeping your gut (and you!) happier. October 4: When you are Healing (post surgery): Getting back on your feet. Jenneke will provide a healthy snack after each presentation. There is no charge for the presentations or the snacks. If you require more information please contact Bobbi Johannessen at: johannessen@shaw.ca or 250-658-8824 or Gwen McPherson at 250-658-5451.